Composer is a package dependency manager for PHP. It’s kind of TGM Activation class for WordPress, but works for any PHP package. Composer allows us to include other PHP libraries in our projects without conflict between them. Without Composer, if a project requires 2 libraries A and B, and both of them requires a library C, then C might be included twice. The scenario can get worse if A and B includes different version of C which can cause a conflict when loading the library. Composer helps us to avoid this issue. Besides, there are more than 100K packages for us to explore if we use Composer. They can be a framework like Laravel, Symphony or a package to handle the payment with Stripe or authenticate with social networks. That means lots of possibility to do something with less code by standing on shoulders of giants! Meta Box is totally compatible with Composer and you can use it as a library for your projects. As Meta Box is a WordPress-specific package, the “project” term here means a WordPress website, plugin or theme. This tutorial will show you how to use it for a plugin. The source code of the plugin is available on Github. This guide is for the Meta Box core plugin. For Meta Box extensions, please see this guide. To make it easier for developers, I’ve created a composer.json file, which contains Meta Box plugin and all extensions. You can grab it here and remove the extensions you don’t want to use. Please follow the very detailed guide on the Composer homepage to know how to install Composer on your system. The first thing you specify in composer.json is the require key. You’re simply telling Composer which packages your project depends on. The package name has the format author/package-name. In this case, it’s wpmetabox/meta-box. The value is the version you want to use in your project. 4. * means the latest version 4. You can set a specific version 4.8.7 or using wildcard. For more info about the syntax of versioning, please follow the Composer documentation. You can add more packages by adding more key-value pairs if your project uses other packages than Meta Box. Make sure you install Composer globally. If you don’t know how to do that, please refer to the documentation in the Installing Composer section above. require 'vendor/autoload.php'; // Relative path. Now Meta Box is available in your plugin and we can start using it. Dependency management: it’s always a headache for managing dependencies in WordPress. There are some works around that like TGM Plugin Activation class and Plugin Dependency. But it’s still far from perfect. Not all plugins are be able to be included inside another plugin like Meta Box. Vast amount of libraries: this is a huge advantage of using Composer. With these well-coded libraries, your development process will be easier, faster and thus, it saves you tons of time. So, enjoy Composer and Meta Box! And share with us how you use them in your projects via the Contact form. We’d love to know that! This video demonstrates how to install Meta Box extensions from wordpress.org. 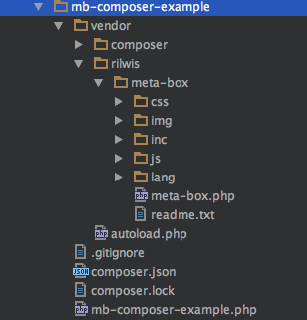 The approach is slightly different, but it show you the idea of using Composer with Meta Box plugins.